Kerri-Anne Kennerley has lashed out at her former employer, Channel 9, likening it to the ill-fated Italian cruise ship the Costa Concordia. According to her, it too has veered off course and hit the rocks – – – Channel 9 is said to be millions in debt and struggling to cope. For 9 years, Kerri-Anne was the host of “Mornings with Kerri-Anne” on Channel 9. In October 2011, Nine boss Jeff Browne ordered a revamp of Kerri-Anne’s long-running show. In fact her last show was Friday 25th November. After being axed from her show she was offered a role on Nine’s Celebrity Apprentice but instead she signed up with the Seven network. After the shock of it all, Kerri-Anne appeas to be her normal bouncy self, but it must have caused her some pain and heartache. If Kerri-Anne had consulted an astrologer like me early last year I would have told her that her career was definitely in for change. She could have in fact jumped ship and avoided the “crash”. 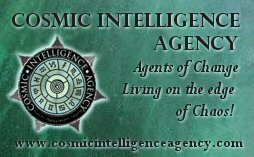 In July 2011, Uranus hit the Midheaven in her chart – the point that indicates career-vocation-status. Uranus represents sudden change, and in the sign of Aries the change is often harsh or delivered in a brash way. Plus, the Nodes were sitting on her Asc-Dsc axis. This combination of contacts suggests a separation from certain relationships, namely her boss or employer. The signs were very literal mid-last year, but there’s more to come. Uranus will once again hit the Midheaven in mid-March, alongside Mercury. She will be responding quickly, perhaps before she has time to think. The deal will be settled when the Sun joins Uranus a week later securing a lucrative financial deal for her. And last, but by no means least, she has a Mars return in April that will see Kerri-Anne back in full force. Uranus, Pluto and the Sun clash in late June but this should see her rise from the ashes – the reinvention of a star. 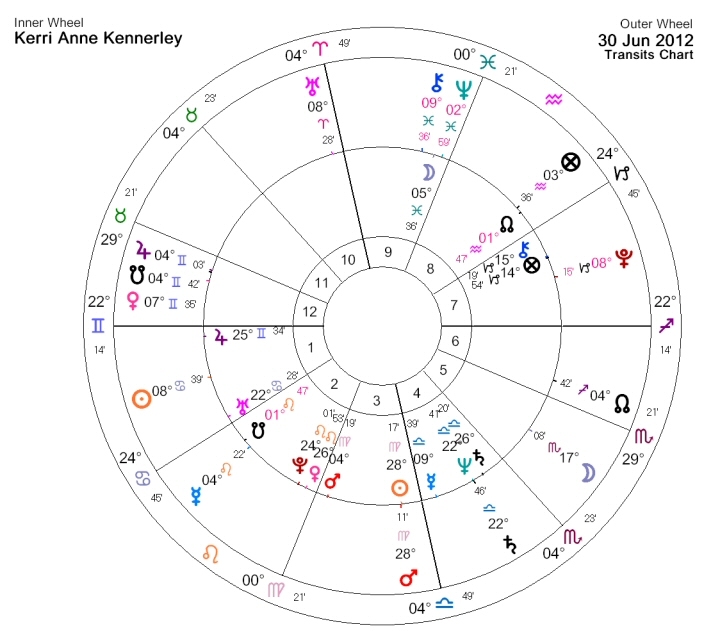 At the same time Mars will join with her natal Sun, and Mercury hits the Nodes – look out for news items at this time about Kerri-Anne. 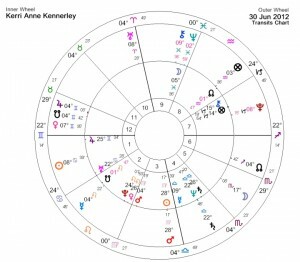 2 Comments on "Kerri-Anne under Uranus’ Spell"
Im just wondering what birth time you used for this chart. Is it reliable. Because i had a differing chart for her. Im interested in following up her latest faux pas. Hi Megan. According to Solar Fire, her birth time is 0.05 am and the chart has an A rating.